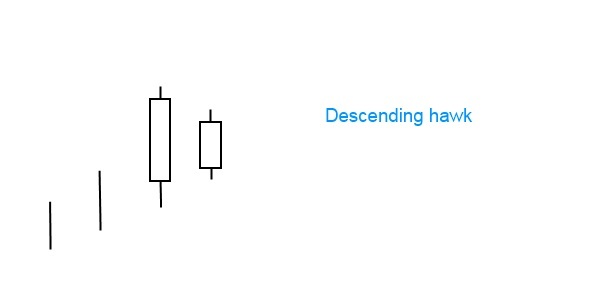 Descending hawk is a bearish reversal pattern, which forms in an uptrend. On the first day a long white candle evolves in the direction of the trend. On the second day, again a white body appears. The body of the first day candle completely engulfs the second candle. Shadows are not important in regard to both candles. The first figure of the descending hawk may be any candle with a white body, appearing as a longe line, however doji or spinning top are not permitted. The second candle of the pattern must appear as a short line and again doji or spinning top is not permitted. The descending hawk resembles the harami pattern, except for the colors of the body. Here both candles are white. It is the bearish version of the homing pigeon.